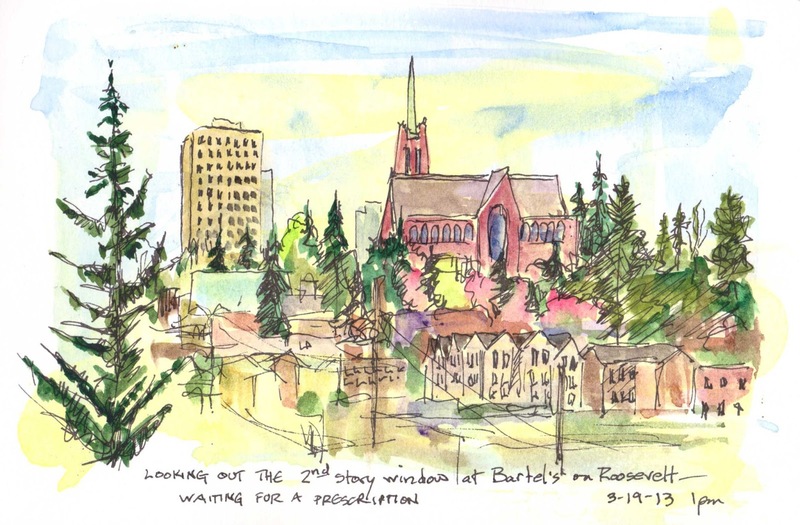 The other day, dashing to a meeting, I stopped in the Roosevelt Bartel's to wait for a prescription. But I had grabbed my sketchbook, and in a 2nd floor corner window, facing south, I had a great little view towards Roosevelt and 50th St. You can see Sacred Heart, of course, and signs of spring. It does help me sometimes, to have only 15-20 minutes to sketch, and adding the color at home, I was able to stay in the quick sketch mode. I go to that Bartell all the time, but I've never noticed this view.... very nice sketch!